Today I went on a round-trip through Switzerland by train. 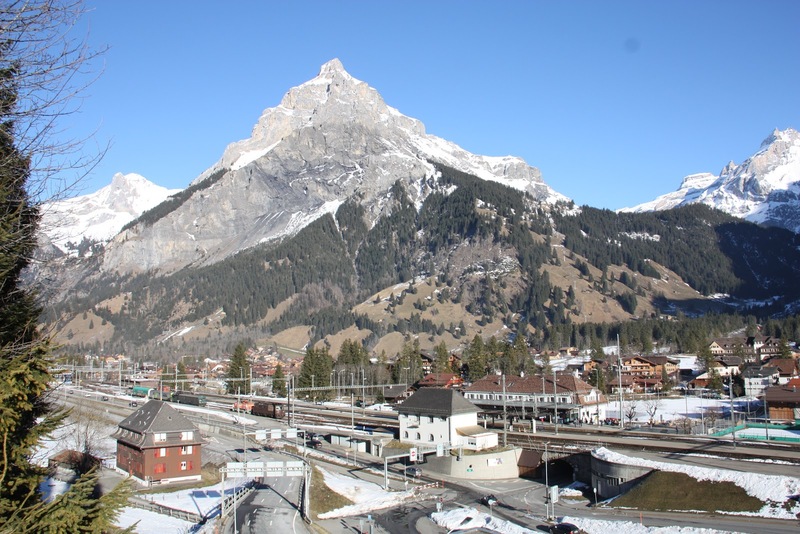 The route started in Zurich-Enge, via Zug to Aarth-Goldau, Erstfeld, and Goeschenen on the Gotthard line to the north portal of the Gotthard tunnel. From Goeschenen I took the Matterhorn Gotthard Bahn (MGB) to Andermatt and on to Brig, traversing the Furka base tunnel and an amazing winter wonder land. From Brig I continued on the Loetschberg line through the Loetschberg tunnel to Kandersteg where I observed the auto loading operations for cars going through the tunnel. After experiencing the Loetschberg tunnel two more times I continued to Bern and back to Zurich. I used a SBB day pass for this 11 hour round trip, with a couple breaks. All the trains I took ran at least once per hour on Sundays with well-planned connections making it easy to plan the trip. Because this is the middle of winter with only about 7 hours of decent daylight, I planned the day so that I would have daylight by the time I got to the Gotthard tunnel, close to maximum sun while on the MGB, and still sufficient daylight at Loetschberg tunnel. This plan worked out quite well, with dusk setting in when I was on my way to Bern. For maximum happiness I should have spent one of the extra hours doing a snow hike near the MGB. However, I have no regrets with how I spent this day. I got really lucky that this was a clear and sunny day, with amazing views. I've split up the trip report into 13 individual posts to keep it manageable. All posts have lots of photos. Photography through train windows is very difficult due to reflections and dirt, so the photographic quality varies. To navigate between the various parts, you can either use the index below this paragraph, follow the "Sunday" links in the month overview on the right, or click the Newer Post / Older Post links at the bottom of each individual post. The morning trip covering the distance from Zurich to the bottom of the ramp leading to the Gotthard tunnel. The famous Gotthard north ramp from Erstfeld to Goeschenen. Trip on the MGB, narrow gauge partial rack railway. Winter views, the Furka base tunnel, and the Glacier Express. Waiting for a delayed train yielded great train in winter scenery photos. Continuing on the MGB down to Brig. Looking around Brig station, the railroad hub between Loetschberg and Simplon tunnels. Traveling the old Loetschberg line through the tunnel to Kandersteg. I spent more time here than I should admit, and took lots of photos. Looking around Kandersteg station some more. More photos of the Loetschberg tunnel, and chronicling the return trip to Zurich via Bern.